I have quite a few cookbooks, but there is only one that I pick up and read front-to-back like a “real” book: The Pastry Queen by Rebecca Rather. And I do it a couple of times a month. I can close my eyes and recite a couple of the recipes by memory, much like the way I recited simple German verb conjugations in the 6th grade. I could psycho analyze why I’ve taken to her book the way that I have – maybe it’s because she’s a fellow Texan, maybe it’s because I’d love the idea of leaving this big city behind for the beautiful hill country myself. But there’s really no need for all the soul-searching psycho babble – just take one bite of her All Sold-Out Chicken Pot Pie. 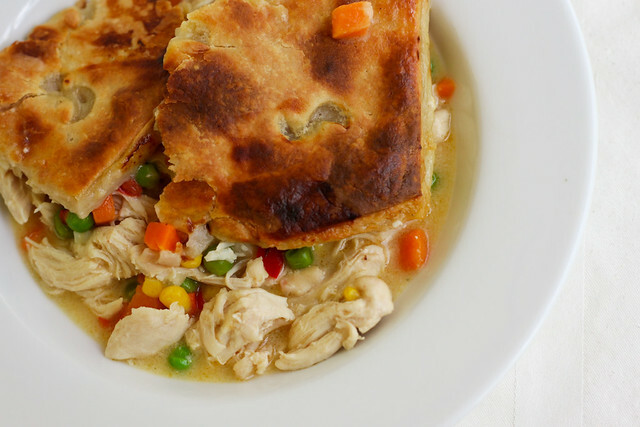 I’d call it the “ultimate comfort food,” but depending on the day and my mood, I could apply that label to just about anything edible 🙂 That’s why we had chicken pot pie on a day when it reached 92 degrees outside. It’s a rich and creamy concoction that lends itself to the flavors of the season. I stuff mine full of on-sale produce in the summer and leftover turkey and green beans at Thanksgiving. And the crust? Oh my goodness, the crust. Can you ever go wrong with cream cheese? The long list of ingredients might look daunting for a Tuesday night dinner, but the prep time isn’t terrible as long as you read the recipe and get organized before getting started. It probably took me almost 3 hours the very first time I made the dish. I learned a few lessons and now it’s in the oven in about an hour. Shuffle the recipe around to suit your veggie tastes and accommodate what you have on hand. And then crank down the AC, turn on some Christmas music, and tell me if it doesn’t feel like winter-in-a-bowl to you, too. 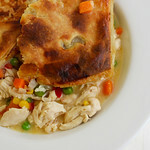 A rich, creamy, and indulgent chicken pot pie recipe. Melt the butter in a large saute pan set over medium heat. Add the onions and celery and saute for 5 minutes. Add the bell pepper and saute about 15 minutes until the vegetables are tender. Add the garlic and cook 1-2 minutes more, until fragrant. Stir in the crushed red pepper, thyme, and add salt and pepper to taste. While the vegetables are sauteing, shred the chicken. Stir the frozen vegetables and the chicken into the vegetable mixture. Set the filling aside. Preheat the oven to 375 degrees F (or don't, if you're cooking for the freezer). In the bowl of a food processor fitted with a metal blade, pulse the butter and flour until crumbly. Add the cream cheese, salt, and pepper. Continue pulsing until the dough forms a ball. Set the dough on a flat surface dusted with flour. Use a floured rolling pin to roll the dough out to 1/4-inch thickness. Measure the diameter of the baking dishes and cut dough into pieces that are slightly larger. Lay the dough on top of the pot pies, and tuck any overhanging edges under. Whisk the egg in a small bowl and brush the dough lightly with the beaten egg. Bake the pies for 20 to 25 minutes, until golden brown. Serve immediately. To cook from the freezer: Preheat oven to 375. Cover top of the dish with foil and bake for 45 minutes. Remove the foil. Whisk the egg in a small bowl and brush the dough lightly with the beaten egg. Bake for an additional 10-15 minutes, until golden brown and the center registers 165F. *Drool* This looks absolutely divine. YUM. I absolutely can not wait to try this recipe! I’ve been thinking about it for weeks since you mentioned it! I LOVE that recipe! I have yet to make anything bad from that book. Have you tried the caramel-filled brownies? They are AWESOME and even better if you freeze them and eat them cold. I love the idea of adding cayenne to the sauce, and one of these days I’ll make mine with my own pastry. 🙂 I also like the idea of adding potatoes. It is one of my favorite cookbooks. You know she has a new one right? A Christmas one. Looking for the cranberry walnut cream cheese muffin recipe from November. Can you repost or email me the recipe. Love the site, recipes and stories. 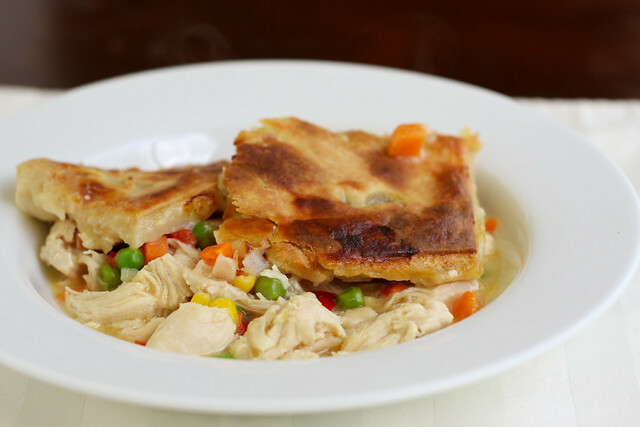 I tried the chicken pot pie…it was great! I did want to mention that you left out the celery and carrots in your ingredient list and the potato and green beans from the instructions. Help! This is the second time I’ve made it, and my crust didn’t brown either time. After 25 minutes, it is still the same color as the raw pie crust. Any clue why?? I do the egg wash and bake at the right temperature, but nothing happens! It tastes cooked and fine, but it doesn’t look overly appetizing – not like your beautiful golden crust! I followed the recipe to a T both times. And to add to the above comment, I even leave it in the oven for an extra 5-10 minutes (I am making a 9×13 dish) and still nothing! I’m afraid to keep it in for too long because I don’t want the inside to dry out.